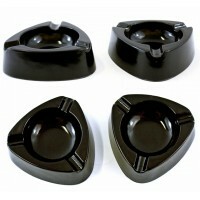 Black Triangle Plastic Ashtray. 4.5". 10ct. .. Exquisite Smoking Lips Cigarette Snuffer. 24ct. ..
24ct Jewel Cigarette Snuffers. Never waste another cigarette again. ..
Metal Tall Standing Ashtray. 25". 1ct. ..
Bokai Tall Standing Ashtray. 37"x6". 1ct. 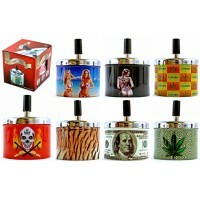 ..
Polished Look Spinning Ashtray Assortment. 5.5". 3ct. 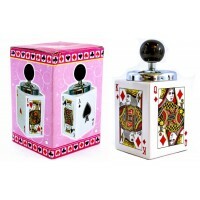 ..
Porcelain Poker Ashtray. 7" x 4". 3ct. ..
Bokai Spin Wheel Ashtray. 5"x5". 1ct. ..
Fujima Diamond Cut Spinning Ashtray. 3". 6ct. ..
Glass Ashtray - Devilish. 3.25". 6ct. 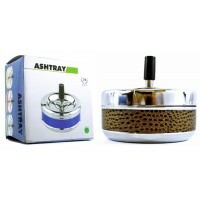 ..
Metal Spin Wheel Ashtray Assortment. 4". 6ct. 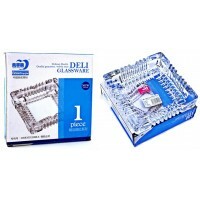 ..
Green Apple Deli Glassware Ashtray. 6". 6ct. ..
American Spirit Metal Ashtray. Assortment. 6ct. ..
Butterflies Glass Ashtray. 6ct. ..
Flashy Lady Design Glass Ashtray. 3.25". 6ct. ..